Picking up the key and the instructions to find the place were good. Great location right in the city centre. Flexible check in times due to the coded box with our key. Kitchen had most of the needed appliances for cooking. Very clean and bright property. Good location, nice atmosphere. Comfortable bed. Excellent location, nice staff. Due to locker issues, the even provided me a late check out. This was my 3rd stay at CitiKoti apartments. The central location is excellent for shopping, trains and tram. The apartment is very warm, which is important in the Helsinki winter. The apartment has all the utensils for cooking, has a washing machine, dish washer, micro wave oven and electro-plate. It's a great location close to everything, kids loved the 2nd level bed, everything worked as expected. Great location, great facilities, nice and quiet, nice and clean (with one exception). There was hairdryer, all necessary kitchen facilities and dishwasher, washing machine. It was easy to imagine staying for longer. Clean apartments. Depressing building but good location and clean apartment. Not much - the whole stay was clouded by the fact that I was given a wrong code to access my key to the apartment. Lock in a great price for Citykoti Downtown Apartments – rated 8.3 by recent guests! 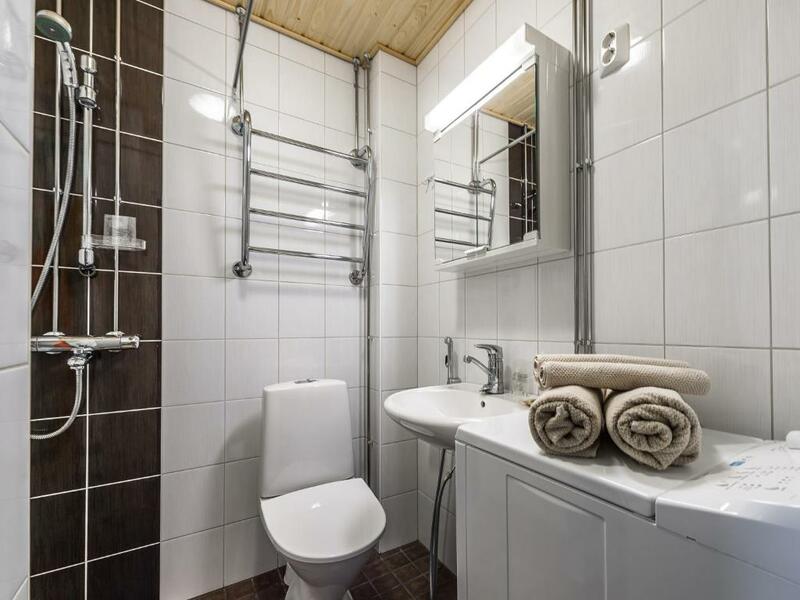 Citykoti Downtown Apartments This rating is a reflection of how the property compares to the industry standard when it comes to price, facilities and services available. It's based on a self-evaluation by the property. Use this rating to help choose your stay! 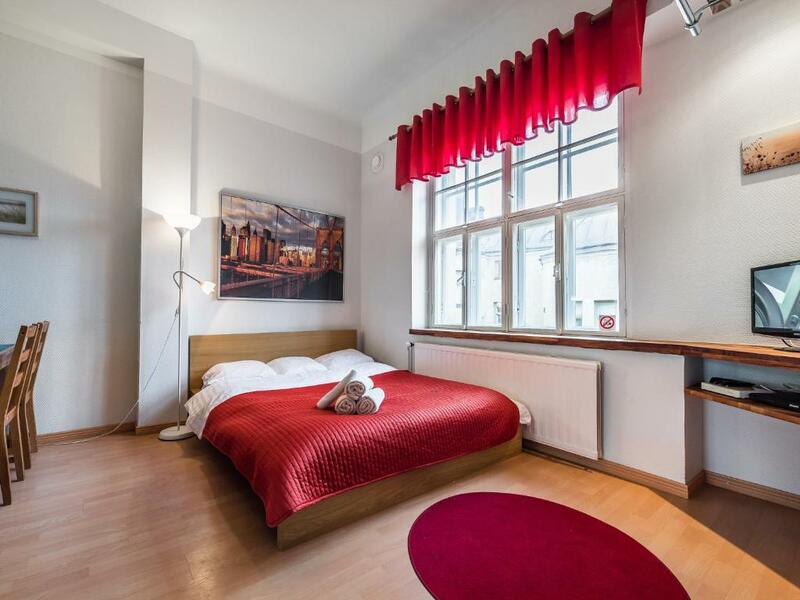 One of our top picks in Helsinki.These contemporary self-service apartments are around the corner from Kamppi Shopping Center and 0.6 mi from Helsinki Central Station. They offer free WiFi and a well-equipped kitchen. The modern bathrooms have a washing machine. Citykoti Apartments feature colorful design and an open-plan living/sleeping space. Each apartment has a flat-screen TV. 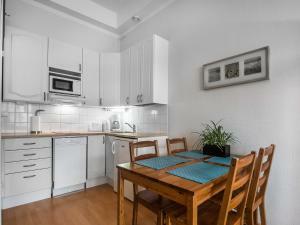 A microwave, dishwasher and electric cooker are also standard in all rooms. Restaurants, cafés and bars are easily accessed. The Alexander Theater and the Sinebrychoff Art Museum are only 10 minutes’ walk from Citykoti. Kamppi Metro Station is 1,000 feet away. 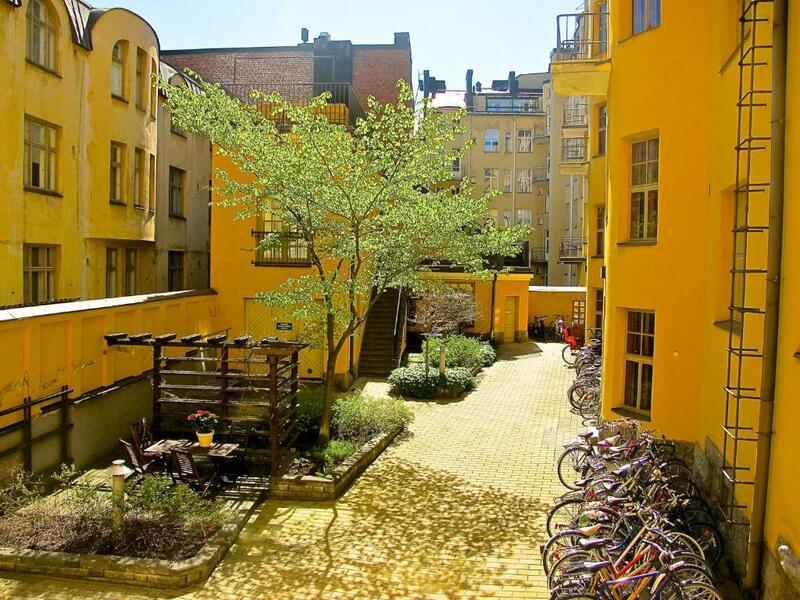 뀐 Located in the top-rated area in Helsinki, this property has an excellent location score of 9.1! When would you like to stay at Citykoti Downtown Apartments? This studio includes a flat-screen TV, washing machine and kitchen facilities. Please note that this studio does not have room for baby cots or extra beds. Accommodations in the studio is only for 2 adults or 1 adult and 1 child. This family studio includes a flat-screen TV, washing machine and kitchen facilities. Two guests are accommodated in the sleeping loft. 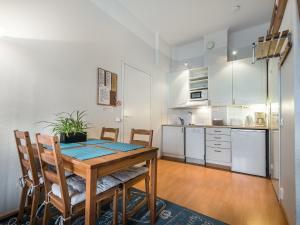 This spacious studio includes a flat-screen TV, washing machine and kitchen facilities. Two guests are accommodated in the sleeping loft. House Rules Citykoti Downtown Apartments takes special requests – add in the next step! Citykoti Downtown Apartments accepts these cards and reserves the right to temporarily hold an amount prior to arrival. After booking, you will receive check-in instructions from Citykoti via email. Citykoti Downtown Apartments is authorized to request a photocopy of the guest’s ID or passport in advance, which should be sent to the property before check-in. Please note that some accommodations types are not accessible by elevator. Tiny apartment and bathroom. Didn't spend much time inside would feel very crowded. Bed isn't that comfortable Room too warm. No interaction with the host/reception. Only one small sad thing is that the earlier check-in is impossible. It is very easy to find the apartment and get keys, the system of collecting key is an mathematical one. In the apartment there us everything for staying, including kitchen with a dish-washing machine. The apartment was very clean and calm, it is only about 15 minutes on foot from the central railway station. And for sure the price for the city center was excellent. The apartment we had didn’t quite live up to the pictures on Booking.com and I found the bed much too hard. The duvets provided were only thin - it would be nice if the host provided extra blankets. I was too cold with the heating off and too warm with it on. An extra blanket would have solved this. The apartment was well equipped and in a convenient location. It was quiet and clean. The bed was too narrow for two persons. It was quite hear-through, our apartement was right next to the elevator and we heard people coming and going quite a lot. Good location, the apartment had all the necessary equipment and it was clean and simple. Sound-proofing could be better, a lot of noise is coming in from the corridor. Locks and doors are a little old, we had to try several times until we could open them. Check in was fun but we needed some help from other guests. Room and location was very nice. 24 hour check-in was really good. Elevator was horribly small, i ran into some trouble since i was travelling with a big backbag, my 4year old daughter and my 2month old baby (with a pram) since the accomodation was on the 6th floor, there was no way to carry the pram up or to make my daughter walk up the stairs by her self. I had to disasemble my pram etc and it was very hard to fit everything in the elevator but at the end we managed somehow. That would have been nice to know in advance.. I had a minor issue and the staff happily helped change my room. 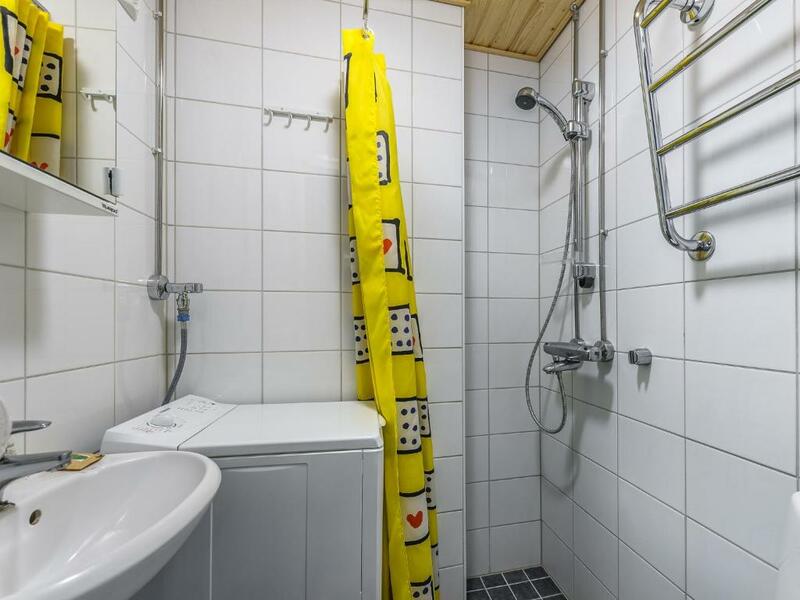 Small bathroom is the only thing I could complain about but it is not a huge problem if you are staying for 2 or 3 nights. Apartment has perfect location. We didn't need to use public transportarion at all to see the most popular places in Helsinki. There is another thing to notice in this apartment, mattress. One of the most comfortable I ever slept on. For the price the offering is great; however the building is old and would benefit from a renovation, especially the shower and the windows (cold air coming in, requiring the heating to be on all the time). 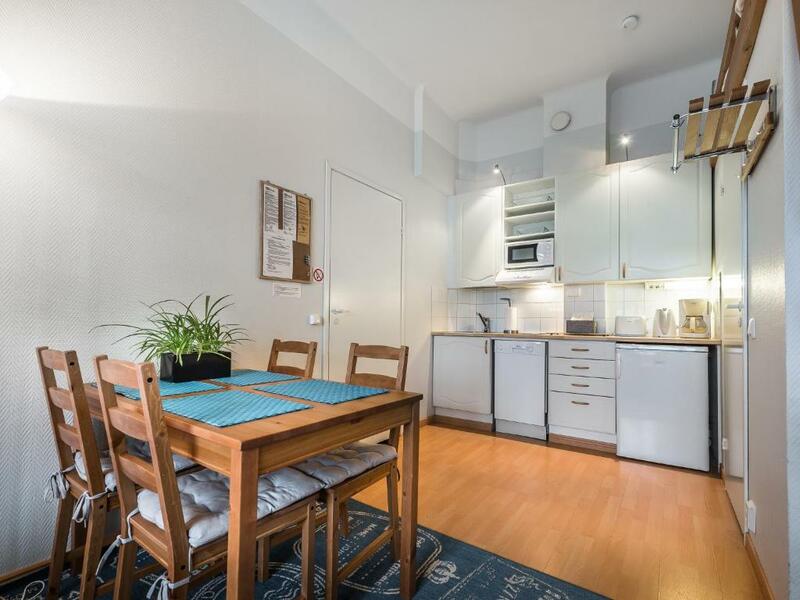 The apartment is in a very convenient location close to Kamppi Mall. The keys can be picked up from a locker and it takes only a minute, so it is all very easy. The apartment is in a backyard and therefore very quiet.